Thanks to the generosity of the late Elmer and Dorothy Eade of King City, deserving nursing students at Hartnell College will be able to pursue their dreams of becoming members of the nursing profession. Mr. and Mrs. Eade, who died in 2002 and 2000, respectively, established a $600,000 scholarship endowment that will benefit Hartnell nursing students. Mr. Eade, born in King City in 1911, was a 1929 graduate of King City High School. Upon graduation, he worked for Associated Oil Co. and on his family’s ranch for many years. Mrs. Eade, also a King City native, was born in 1913. Upon graduation from King City High, she went on to attend San Jose Hospital’s nursing program, and later worked as a Registered Nurse (RN) for the King City Hospital and Mee Memorial Hospital in King City. She also worked at Basic Vegetables in King City as an industrial nurse. At that time, firms like Basic Vegetables were required to have nurses on staff to treat injuries and illnesses. Kathie Grab, grandniece of the Eades, said her aunt was very proud to be a nurse. Kathie herself is a graduate of Hartnell’s Licensed Vocational Nursing (LVN) program. As a matter of fact, she was her class’s valedictorian. Kathie is pleased that the Eades’ gift will benefit Hartnell nursing students. In addition to establishing the scholarship endowment for nursing students at Hartnell, the Eades’ will included gifts to Mee Memorial Hosptial, Salinas Valley Memorial Hospital, Shriners Hospital in Sacramento, and scholarships for agriculture students at California Polytechnic State University, San Luis Obispo. 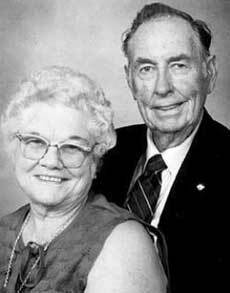 The Eades were married on July 12, 1936 and were involved with two large cattle ranches in the southern most part of Monterey County-they owned the Lone Oak Ranch (a.k.a. the Crown W Ranch), east of King City, and operated the Wild Horse Canyon Ranch, southeast of King City. They retired from ranching in 1969 and moved to King City. The couple died two years apart. Mrs. Eade died in 2000 at age 89 of natural causes. Her husband passed away in 2002 at age 90, following an automobile accident. The Eades were avid gardeners and also enjoyed traveling. They visited most of the states in the nation and much of Canada, Brazil, China and England. They also vacationed at their summer home in Oregon. Mrs. Eade was very active in the La Posa chapter of Eastern Star, from which she received a service award and pin for 50 years of service. She also enjoyed crafts and was an avid collector of dolls and china. Mr. Eade was an Islam Shriner and a 50-year member, as well as past master, of the Santa Lucia Masonic Lodge, No. 302, of King City, from which he received the Hiram Award-the highest award bestowed by the Masons. He also was a member of the Scottish Rite of San Jose, and a former member of the Monterey and San Benito cattlemen’s associations.